Origin: Widespread from Mexico to Panama and Texas. 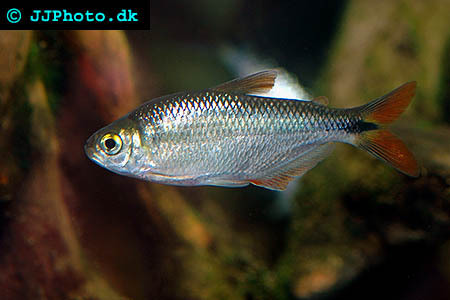 Company: Astyanax mexicanus (Blind Cavefish) are best kept alone. Aquarium setup: Astyanax mexicanus (Blind Cavefish) are as the name suggest blind and should be kept in a dark aquarium without plants to mimic their natural surroundings. The aquarium can be decorated with rocks or other decorations to make it more attractive. Feeding: Astyanax mexicanus (Blind Cavefish) accepts flake food. Breeding: Astyanax mexicanus (Blind Cavefish) can be breed in aquariums and the breeding can be stimulated by dropping the water temperature to 20˚C/ 66-68˚F. They are egg scatters: remove the parents from the aquarium and not the eggs since the eggs are very sensitive. The eggs hatch after 2-3 days and the fry are within a week. The fry are large enough to accept baby brine shrimp as well as crushed flake food.